The cat righting reflex is a cat's natural ability to turn itself around as it falls so it will land on its feet. This righting reflex starts to happen at 3–4 weeks of age. The cat has entirely learned how to do this by 6–7 weeks. Cats are able to do this because they have a flexible backbone and a clavicle that does not move. The minimum height needed for this to happen safely in most cats is about 12 inches. Cats without a tail can also do this. This is because a cat mostly moves its hind legs and does not use much angular momentum to set itself up for landing. So a tail is not really needed for this skill. Using this righting reflex, cats can often land without injury. But, this is not always true, since cats can still break bones or die from extreme falls. In a 1987 study, written in the Journal of the American Veterinary Medical Association, 132 cats were looked at after having fallen from buildings. The injuries per cat were more, depending on the height fallen; up to seven stories high. Above seven stories, the injuries were less. 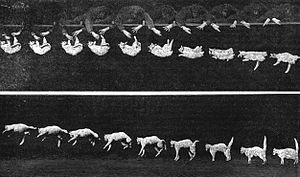 The study authors think that after falling five stories, the cats reached terminal velocity. At that time, the cats relaxed and spread their bodies to increase drag. Bend in the middle so that the front half of their body turns in the opposite direction than the rear half. Tuck their front legs in to reduce the moment of inertia of the front half of their body. Stretch out their rear legs to increase the moment of inertia of the rear half of their body. This happens so that they can turn their front half very far (as much as 90°), while the rear half is turning opposite very much less (as little as 10°). Extend their front legs and tuck their rear legs; so they can turn their rear half quite far, while their front half turns opposite quite a bit less. If the cat is not flexible enough (able to bend easily), it may need to do steps two and three again in order to completely right itself. Besides this righting reflex, cats have body features that help keep them safe in a fall. Their small size, light bones, and thick fur decrease their terminal velocity. Also, once righted they may also spread out their body to increase drag and slow how fast they are falling. They also relax as they fall, which protects them some when they land. ↑ Jeri A. Sechzera, Susan E. Folsteina, Eric H. Geigera, Ronald F. Mervisa, Suzanne M. Meehana (December 1984). "Development and maturation of postural reflexes in normal kittens". ScienceDirect 86 (3). doi:10.1016/0014-4886(84)90084-0. http://www.sciencedirect.com/science/article/pii/0014488684900840. Retrieved 20 August 2014. ↑ Huy D. Nguyen. "How does a Cat always land on its feet?". Georgia Institute of Technology, School of Medical Engineering. Retrieved 2007-05-15. ↑ "The Straight Dope: Do cats always land unharmed on their feet, no matter how far they fall?". Retrieved 2014-08-23. How do cats always land on their feet? Very slow motion video of the African caracal. This page was last changed on 20 April 2018, at 18:11.